It was a tough day today, I forgot to eat and then didn’t breathe enough and sent my heart racing… Duh, Eat Something Dummy!Anyone else ever do that? Anyway, this place has everything, Mosaic Man to start, and he’s fresh! 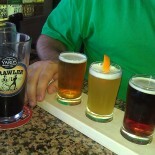 Yum Bravo Glasstown Brewing, delicious! This entry was posted on May 30, 2018 by DuffBrew in Uncategorized.